The Reading Life: Who's Afraid of E-Books? I see an image of the Leaning Tower of Pisa, and it calls back the heat of a summer day, the slow, steady climb up, my cramped legs and thumping heart (owing to both being tired and being terrified of heights), my father (from whom I inherited my fear) sharply calling my name when I strayed too close to a window, the exhilaration of completing a seemingly impossible objective. For a while now, I’ve been trying to understand why, despite the many compelling advantages of e-readers (some of which I enumerated here), I cannot warm up to them, why books—bound in paper between pretty covers—maintain their hold on me. Like memory (or the memory of reading them), books provoke associations and emotional connections. I see or hear the title “The Night Circus” and am called back to the day I was reading it—last October during Superstorm Sandy, a flashlight at my side anticipating the moment the lights would go dark. The particular weight of the book in my hand, the evocative black, red, and white cover, the tension of the storm echoed for me in the tension of the story—these are all part of the particular way the novel worked on me. For those of us who are concerned with such things, Fry’s analogy, rendered pictorially here, offers a comforting reminder that technological discoveries can be additions rather than displacements. 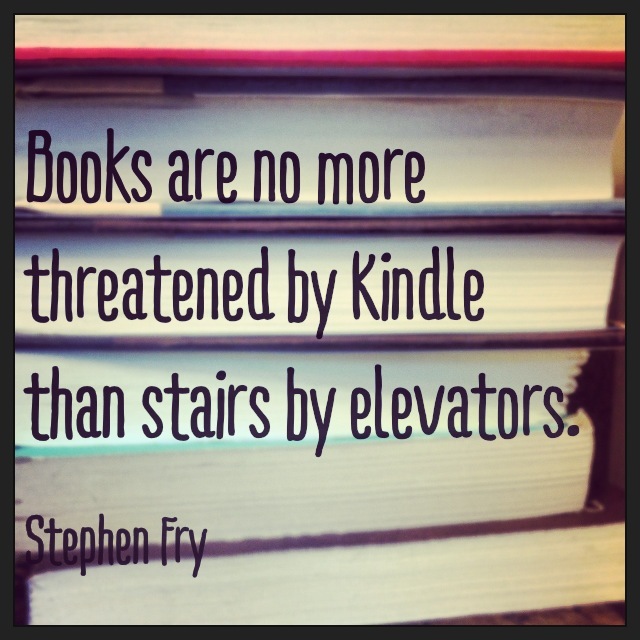 What about you—agree or disagree with Fry’s analogy?